May 9, 2013 August 5, 2013 ~ M.
Midday check-in. I go between bouts of wanting to put my head on my desk and nap and feeling absolutely energized – ready to take on the world! This morning I discovered Coconut milk in my coffee. Not the coconut milk found in the carton by the milk and half and half, this is the coconut milk you find in the can. 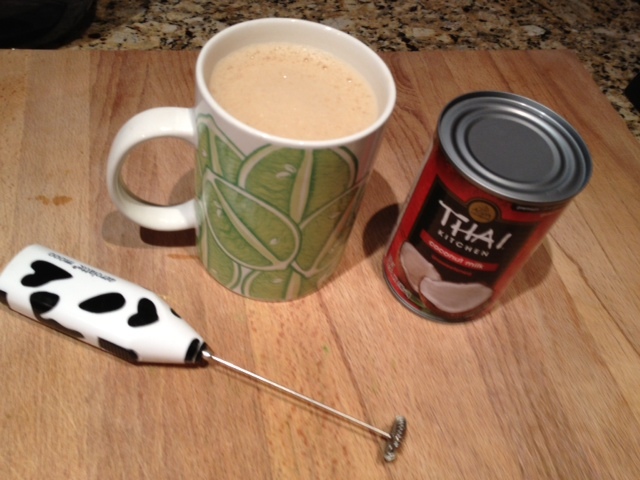 And (this is coming from someone who loves her heavy cream in her coffee and grew up giving away her Almond Joys at Halloween, blech..) the coconut milk from a can in your coffee is GOOD. Drain the water and use just the coconut paste, it’s so thick and creamy! Bonus points, stir it with a hand-held frother, and you’re standing in the middle of First Cup of Coffee in the Morning Heaven. For lunch, sliced roast beef over spinach salad with olive oil and vinegar. Pretty basic, but does the job when it’s busy at work. This was left in the break room today. 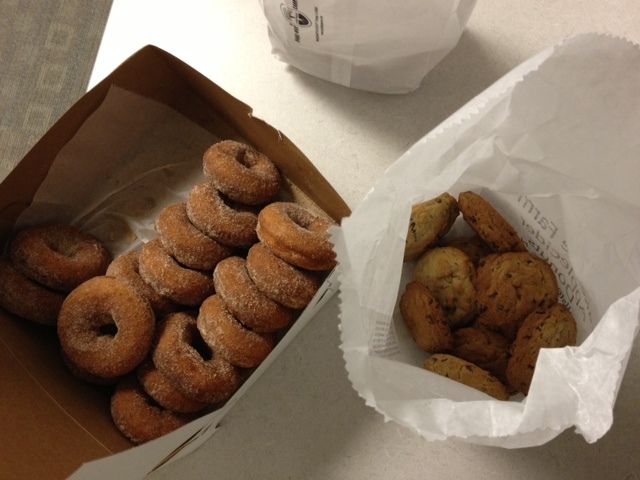 Cider doughnuts and chocolate chip cookies. I stood over them letting the fresh baked aroma goodness waft up to me, and took a picture. I remain strong with the help of my Whole30 Crew. ‹ PreviousDay 3 – To the Finish.